« Lion hunting or lionfish hunting? A look inside a lionfish stomach. So I thought it was about time I opened up a few lionfish, so that we could have a look inside a lionfish stomach. What exactly have they been eating? 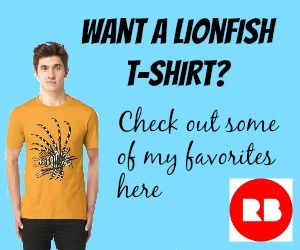 In a previous post I told you about “What do lionfish eat?“. Now lets see inside a few stomachs and see what we can see. 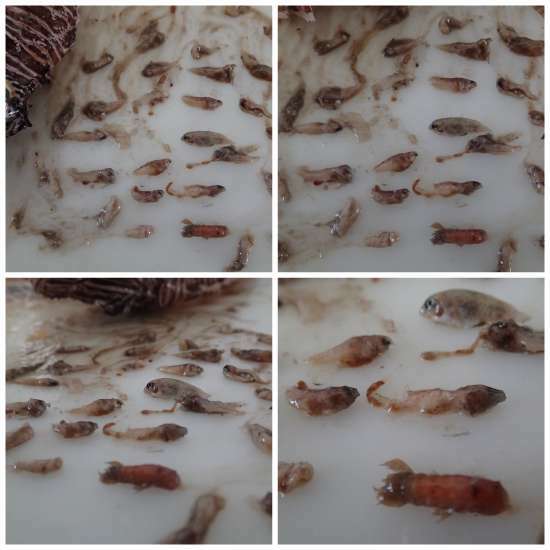 This is a collage of photos showing the contents of just one lionfish I cut up at the end of 2014. That’s a lot of little fish inside the stomach of one lionfish. It was about 24 tiny fish in total. However, recently I thought it would be better to make a short video. So over a couple of days quite recently (August 2015) I decided to open up a number of the bigger lionfish that I had caught and my wife Deby kindly agreed to video the action, if you can call it action. You may be able to hear her now again close to retching and near the end of the video you’ll hear our 3 legged cat Oliver trying to get in on the action. Oliver loves microwaved lionfish, he cannot get enough. Remembering that lionfish can expand their stomachs over 30 times I chose quite a few with what I thought were large stomachs. However, I was soon to find out that the expansion was their swim bladders that I had not shot with my pole spear, instead of a stomach full of fish. The majority of the fish had absolutely nothing inside their stomach. You could regard this as either awesome or terrible news. Awesome that they had struggled to find a meal and would hopefully starve to death – unlikely. Or terrible in that they had eaten every little fish in the area. Remember that lionfish can eat any fish that they can cram inside their mouth, and are known to eat fish that are half the size of themselves. However, I now believe that it may be more about the time of day that we hunt the lionfish. If we did a dusk dive or a dawn dive I believe we will have found more fish and other creatures inside their stomachs, as dusk and dawn in the time that most lionfish hunt for their prey themselves. 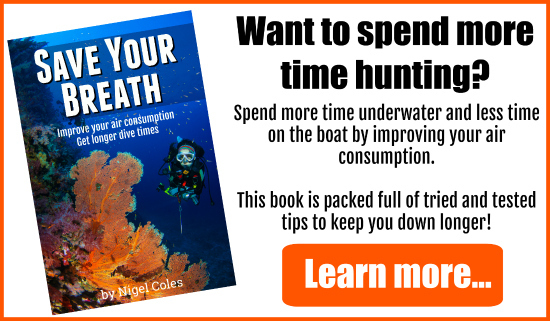 But we tend to do our 2 dives of the day around 9am and 12 noon. By then most of the fish that the lionfish will have eaten will have been digested and moved beyond the stomach. 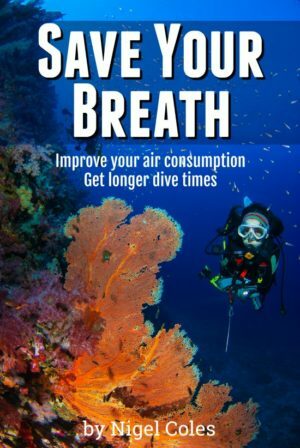 If we ever decide to do any dusk or dawn diving I will do a follow up to this post to prove my theory, or not. Remember Kill ’em and grill ’em.